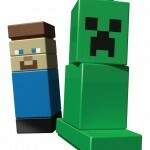 The LEGO Minecraft delivery date has been pushed back yet again. The official LEGO shop is now saying the expected ship date is 12 December. That still leaves Ebay and vastly inflated prices (from $100 to $150) as the only alternative. As Christmas looms ever larger this may turn out to be the only way to go if you have made promises.